NASHIK, India: At an ancient Hindu riverside festival, the millions hoping to cleanse themselves of sin are also unwittingly informing high-tech solutions in crowd control, disease outbreak and public security. A group of technology innovators has launched a digital information platform at the six-week Kumbh Mela, or Pitcher Festival, that they say is helping to maintain order and calm among those camping near the river bank and piling into the water for one of humanity’s largest religious gatherings. Twelve years ago, dozens died in a stampede in the same festival. 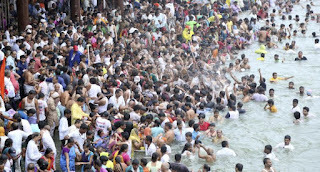 Halfway through this year’s event there have been no such incidents as the immense crowds as they wade into the temperate waters of Godavari River, in an ancient ritual seeking spiritual rebirth from Hindu deities. They pour trickles of water from cupped hands held over their foreheads. Gently, they lower their bodies until they are fully immersed. “We had thought about Kumbh Mela as this gathering of masses, people who are on path of self-discovery. But in a way, innovation and innovators are also always on a path of self-discovery,” said Ramesh Raskar, associate professor at the Massachusetts Institute of Technology Media Lab, which has been leading scientists, charity workers and officials from around India in a two-year effort dubbed “KumbhaThon” to develop technology solutions to better manage population-dense events. “We want to see how we can take this amazing challenge in crowds and food and security and housing and transportation ... and see how we can make this a tech-savvy Kumbh Mela,” he said. The digital platform, accessible by a free Android cellphone app, allows authorities and festival-goers in the central Indian city of Nashik to collect, view and share data about festival food carts, traffic jams and the location of porta-potties or medical tents, giving users an up-to-date record of what’s happening and where. The information is also available online at www.kumbha.org. Developers skipped making an iOS app for iPhones because there are at least 10 times as many Android users in India as those using the more expensive iPhone. Compiling data taken at medical tents, the app tells festival-goers about any outbreaks of dengue, jaundice or other diseases, though so far there have been no outbreaks of note. Using cellphone power data to estimate crowd sizes, the digital platform also gives officials information that helps them decide when to put up blockades or disperse crowds. The KumbhaThon team has discovered that most bathers prefer to go into the river in the afternoon, and mornings are relatively unpopulated. On the most auspicious bathing days, however, the riverfront is constantly jam-packed. Indian officials are embracing the new tech, and have ordered telecommunications companies to share data with them. “We are getting (data on) how many people are in the vicinity of a particular tower for that company, and we are using that data to track crowds in the Nashik city as well as provide the administration with tips or analytics on how they can better plan according to that data,” MIT student Mrinal Mohit said. Another innovation for counting crowds came from a 15-year-old boy from Nashik. Hearing about the KumbaThon effort almost two years ago, Nilay Kulkami teamed up with three other tech engineers to develop a rubber doormat that counts footsteps and then reports the data back to officials. “I wanted to do something that is useful for people. Developing a game, that’s not useful. It’s better to make something to help people,” he said of their invention, which they call “Ashioto,” which means “the power of footsteps” in Japanese. This is not the first time India has looked to technology to leapfrog toward modernity. High-tech solutions have increasingly provided India’s hundreds of millions of poor with lifestyle solutions — for example, giving them cellphones in places without landlines, or solar power for communities not yet hooked to the electricity grid. Pilgrims at the Kumbh Mela were enthusiastic about the tech being shown through the KumbhaThon app. At the same time, the MIT team is compiling an enormous dataset that can help shed light on how people use technology. “Millions of Indians from all over the country, of all castes, classes, races and ethnic backgrounds congregate on Nashik. And we think that this is a perfect setting to sample the country,” MIT Media Lab scientist Pratik Shah said.